This must-have Test Prep guide comes with two practice tests, answers thoroughly explained, and a CD-ROM that includes two additional practice tests plus answers and automatic scoring. 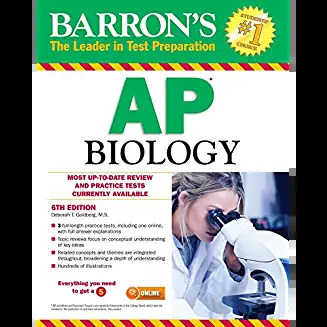 Purchase also includes access to one more full-length online AP Biology test with all questions answered and explained. Great for reviewing, and has all the material you need to know. Wish there weren't so many obvious typos though, especially by the 6th edition of this book. The format of its questions changes a lot from the last edition,personally feel its context approaches to AP Curriculum more.It's helpful because it increases the conditions of a question which matches AP curriculum that wants student to have a strong reading capability. EVERYTHING YOU NEED TO HELP SCORE A PERFECT 5. 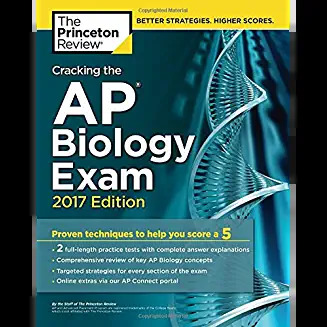 Equip yourself to ace the AP Biology Exam with The Princeton Review's comprehensive study guide—including 2 full-length practice tests, thorough content reviews, access to our AP Connect Online Portal, and targeted strategies for every section of the exam. 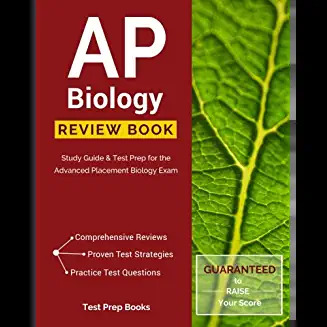 Great review book for AP biology at a great price. This book gives fantastic overview on common AP exam topics. I use this in my classroom on a daily basis and I feel like my students are well prepared for their exam. I will be buying these for future classes as well. Excellent material for study guides. This Review book is amazing. My only regret is that I didn't know about it sooner. It would've definitely come in handy when I was prepping to take my TEAS test. (Covers everything on the Teas with the exception of the Human Anatomy) it's detailed, easy to understand, an in-depth on every subject. It offers three practice test the answer to the questions and even an explanation for each question. I definitely recommend this for not only the AP Biology test but the TEAS as well. This review book paired with the study manual are Guaranteed to INCREASE your test scores! You won't go wrong with this purchase! Sincerely, Science Major! I don't rely on just one book when I am preparing for a huge test. This is one of the books that I have been using to study. What I really like is that this book offers many visual helps like tables and charts for example when learning the genotypes of mendelian genetics this book has not only explained the different types such as heterozygous homozygous but it shows the table of what is recessive and dominant. I am a visual learner and prefer to physical see what the passage is stating to help build the understanding of the material. A wonderful book and study guide for advanced placement biology. Explains concepts, provides questions and answers and test strategies. Would definitely recommend this book to anyone taking AP Biology!